Driven to Deliver®, Project After Project. The Opus Group® is a family of commercial real estate development, construction and design companies headquartered in Minneapolis with offices and projects across the country. Guided by our mission and values, we operate as a multidisciplinary team with expertise in development, capital markets and finance; project management and construction; and architecture, engineering and interior design. With our unique one-team approach from project inception through completion, our integrated design-build model has proven results in providing both time and budget efficiencies. 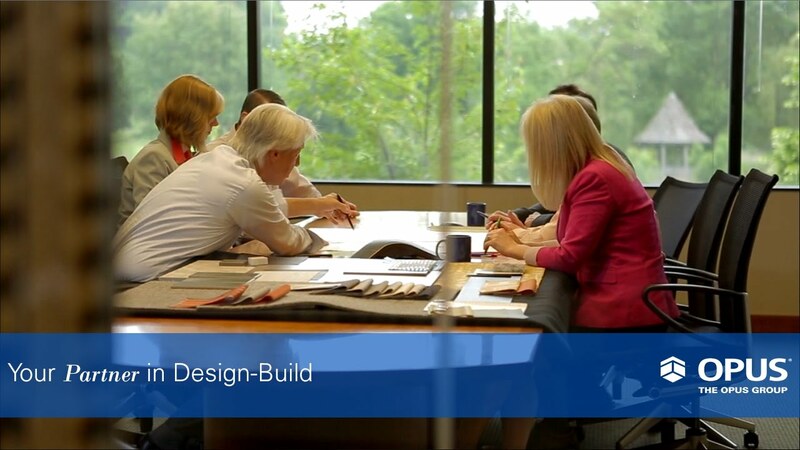 Our promise is steadfast—to collaborate with you, to incorporate your design aspirations and to deliver high-quality buildings with enduring value that support your organization's mission and vision—on time and on budget. We are well-equipped to tackle any project across the United States. From retail projects for Gander Mountain in the South to a corporate headquarters for Church & Dwight, Co., Inc.—makers of Arm & Hammer—in New Jersey, we bring the best people and skill sets to every project. Delivering customized solutions to your project is what makes us a great partner—now and into the future. We are led by a diverse team of experts respected in their fields and directed by a Board of Directors comprised of industry experts and business leaders. We are built on the rich history and tradition of our earlier companies. To learn more about this history, view the archive decades. New Decade. New Names. New Sectors. Stadium Village Flats, a luxury student housing complex adjacent to the University of Minnesota and Opus' first student housing project, which became part of a significant and growing student housing business for Opus. Crescent Ridge Corporate Center I, the first multitenant building in Minnesota to achieve LEED-EB Gold certification. Showcasing integrated skills and expertise in a landmark project in downtown Omaha, Neb., Opus developed, designed and constructed ConAgra's corporate campus in the 1990s. After completing the four-building, 450,000-square-foot campus, ConAgra again looked to Opus' expertise to complete additional campus developments, including two parking decks and a 150,000-square-foot Global Trading Center. The 1990s also saw Opus distinguish itself within the government sector, constructing the California Department of Justice building in Sacramento, Calif.
Winning a competition to design and construct the Mariucci Arena at the University of Minnesota and completing the downtown campus for the University of St. Thomas in Minneapolis, Opus showcased its knowledge and expertise in the institutional sector. 100 and 150 South Fifth Street—buildings that changed the skyline in downtown Minneapolis. American Family Insurance office (Minnetonka, Minn.)—achieved a new level of client service excellence as the first project to include a detailed study of the client's space needs as part of the design process. In the 1960s, Rauenhorst Construction Company stripped away the age-old tensions between architects and contractors—horizontally integrating the two components of projects to promote accountability and responsibility from concept to completion. The company launched this turnkey approach with the completion of an office and manufacturing facility for The Toro Company—and broke new ground as a leader in the design-build delivery method, saving clients time and money. In 1953, Gerry Rauenhorst founded Rauenhorst Construction Company grounded in a vision to build a strong reputation of integrity in the community. The young company's first contract was for the construction of the Zion Lutheran Church in Rauenhorst's hometown of Olivia, Minn.
From its first headquarters building in Bloomington, Minn., Rauenhorst Construction Company embraced a culture of honesty—making a commitment to complete projects on time and on budget—and building trust with clients along the way.